Earn up to 3,150 reward points. Titan Field Frames are among the strongest and most rugged frames currently on the market. These frames are designed specifically for touring drum corps and bands that are transporting, competing, and rehearsing on a daily basis. 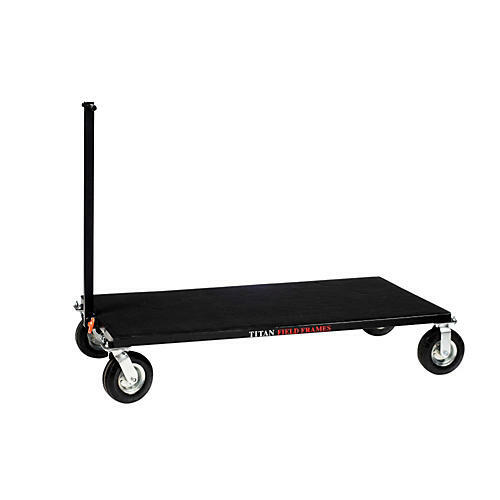 To set the standard, the Equipment Transporter Field Frame is made with heavy gauge steel, it comes with 8" pneumatic tires and comes with a T-bar hitch to help with transporting your equipment. The durable all-weather carpeted surfaces, allow your equipment to be transported scratch free. All Titan frames are flush welded to provide smooth surfaces and a high quality finish. Custom sizes are available; please contact us to find out more! Titan Field Frames are proudly made in the USA. Their strength and durability is backed with a 3 year manufacturer's warranty. Order now and make your presentations fast and easy.